For each player who suited up in a Blueshirt this season we will take the good, we will take the bad and take them both and see what we have. And this time around we started with the high numbers and are up to the first of two #86s, Jeremy Williams. 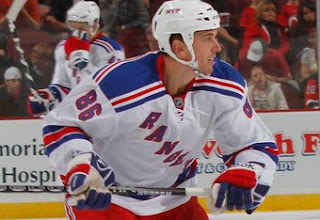 #86's #s: 1 game, no goals, no assists, even, no PIM. Take the good: In his one appearance back in October Williams saw just six shifts for a total of 3:43, just 16 more seconds than Boogaard in the same game. Um, no Devils scored while he was on the ice so that's good, right? Take the bad: No Rangers scored while he was on the ice so that's bad, right? But seriously, in Hartford he scored 32 goals, 15 on the power play and still the Blueshirts didn't bring him back to Broadway. That says something. Take them both and then we have: A guy who probably should seek employment overseas next season, unless he truly enjoys the bus league. Williams - a scorer - couldn't make it on the Maple Leafs and couldn't make it on a desperate Ranger team desperate for goals so perhaps the NHL dream is almost over. Might as well see the world and make some money, right?